THE EXTRAORDINARY SECRETS OF APRIL, MAY, AND JUNE --- The title may be a mouthful, but this entertaining novel is a perfect summer read. I hugged my sisters and they fit against my sides like two jigsaw pieces that would never fit anywhere else. I couldn’t imagine ever letting them go again, like releasing them would be to surrender the best parts of myself. April, the oldest and a bit of a worrier, can see the future. Middle-child May can literally disappear. And baby June reads minds—everyone’s but her own. When April gets a vision of disaster, the girls come together to save the day and reconcile their strained family. They realize that no matter what happens, powers or no powers, they’ll always have each other. Because there’s one thing stronger than magic: sisterhood. I fell in love with Robin Benway's writing in her hilarious debut AUDREY, WAIT!, and I couldn't have been more excited to snag an ARC of AMJ at the SCBWI Winter Conference. I mean, three feisty sisters with magic powers? My inner Charmed fan (ahem, the Shannen Doherty seasons) squealed with glee. 2. Hilarious dialogue. It's where Benway's writing shines. Witty and current without crazy amounts of pop-culture-ness. Always makes me smile! 3. Sisters. The most complicated relationship on the planet, and Benway tackles it well. A sister is your best friend/worst enemy who happens to know all your dirty little secrets... dun dun dunnnn. These girls are super close in age, which makes their lives overlap even more. 4. Cute boys! As sub-plots, and mixed into the primary plot of "OMG vision of future big bad" (! ), are a couple super cute boys. Like, real life, non-sparkly love interests that I kinda want to send back in time to my high school self as a Christmas present. 5. Um, hello, magic powers. So magic powers are universally awesome, but AMJ also tackles the very practical elements of having a secret special ability. (Like when May's hands go invisible in public when she's upset. Not so cool.) And that's part of the giggle-out-loud relatability of the book. It feels way more like a contemporary novel than a paranormal, which makes it stand out from the crowd. Robin Benway's sophomore novel will definitely please fans of AUDREY, WAIT! --- though I must admit, Audrey's still my gal --- and there's a ton of potential for future AMJ novels. The girls have room to grow into their powers (and to get into more trouble), and there's plenty of mystery surrounding the origin of their abilities. I love these sisters, and I hope to see more of them! AMJ is available on August 3rd from Razorbill! 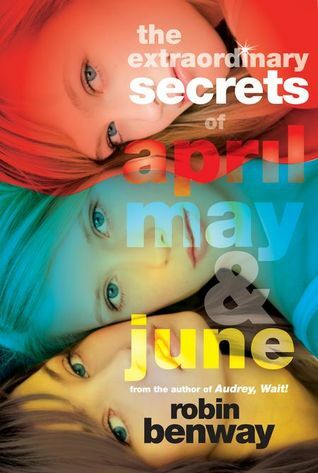 *** Do you want to win my ARC of THE EXTRAORDINARY SECRETS OF APRIL, MAY, AND JUNE? Check back tomorrow for a guest post by Robin Benway and a giveaway of the book! Robin's website and Twitter account. Did you review AMJ? Link it in the comments! I haven't posted my review to my blog yet, but I read this awhile ago and I LOVED IT. I reviewed it, but I won't link here since I didn't think it was extraordinary. I'm glad others are loving it though.